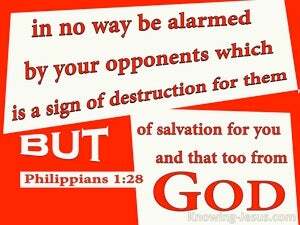 ﻿ Philippians 1:28 in no way alarmed by your opponents--which is a sign of destruction for them, but of salvation for you, and that too, from God. not being frightened in any way by your opponents. This is evidence of their destruction, but of your deliverance-and this is from God. 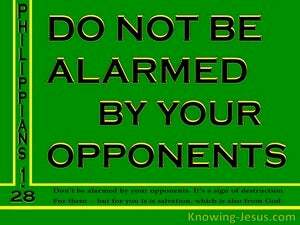 and that you are not intimidated by your opponents in any way. This is evidence that they will be destroyed and that you will be saved and all because of God. And not being frightened in anything by those who oppose, which is indeed a sign of destruction to them, but to you of salvation, and this from God. And do not [for a moment] be frightened or intimidated in anything by your opponents and adversaries, for such [constancy and fearlessness] will be a clear sign (proof and seal) to them of [their impending] destruction, but [a sure token and evidence] of your deliverance and salvation, and that from God. [I also want to hear] that you are not being frightened by those who oppose you, which [opposition] is proof that they will be destroyed, but that you will be saved, and this will [all] be done by God. and in nothing terrified by your adversaries: which is to them an evident token of destruction, but to you of salvation, and that from God. in no way frightened by your opponents. This is a sign of destruction to them, but of salvation for you and that too, from God. without being under any the least apprehension from your adversaries: this will be to them a sign of their ruin, and to you of salvation, by the divine appointment. Never for a moment falter before your opponents, for your fearlessness will be a sure sign for them of their coming destruction, but to you it will be an omen, from God himself, of your deliverance. And in nothing terrified by your adversaries, which is to them an evident token of perdition, but to you of salvation. and in nothing terrified by your adversaries, which is to them an evident token of perdition, but to you of saving health and that of God. And terrified in nothing by them being hostile to you: which to them is truly an indication of destruction, and to you of salvation, and this from God. And in nothing terrified by your adversaries: which is to them an evident token of destruction, but to you of salvation, and that of God. and terrified in nothing by your adversaries. For this is to them an evident token of perdition, but to you of salvation, and that of God. and in nothing fearing your adversaries: which is to them a token of perdition, and to you a sign of salvation, and that of God. Never be scared for a second by your opponents; your fearlessness is a clear omen of ruin for them and of your own salvation ? ?at the hands of God. and in no way terrorized by its enemies. For you fearlessness is a clear indication of coming ruin for them, but of salvation for you at the hands of God. and by not being intimidated in any way by your opponents. This is a sign of their destruction, but of your salvation -- a sign which is from God. and not dismayed on any occasion by your adversaries; which is indeed the proof of perdition to them, but of salvation to you, and that from God. Without ever shrinking from your opponents. To them this will be a sign of their Destruction and of your Salvation--a sign from God. And in nothing terrified by your adversaries: which is to them an evident token of perdition, but to you of salvation, and that from God. Never for a moment quail before your antagonists. Your fearlessness will be to them a sure token of impending destruction, but to you it will be a sure token of your salvation--a token coming from God. Never in the slightest degree be frightened by your opponents, for such fearlessness will be strong evidence to them of their impending destruction, but to you a sure sign, and that from God, of your salvation. and are in nothing terrified by your adversaries: which is a demonstration of ruin to them, but to you of salvation, and this from God. "He who offers a sacrifice of thanksgiving honors Me; And to him who orders his way aright I shall show the salvation of God." AND ALL FLESH WILL SEE THE SALVATION OF GOD.'" "I say to you, My friends, do not be afraid of those who kill the body and after that have no more that they can do.